Many of many times coworkers (from three different workplaces) have suggested that I go into business for myself. And as a young adult, fearless to take risks and yet fearful of what people think of you, there was this belief within me that being a “hard worker” [within a company] will take you places. Well, that’s not ALWAYS true. Being at two dead-end jobs (one downsizing/shifting and the other just dreadfully monotonous) can make life feel purposeless. That’s when I made a decision (encouraged by my accountant) to [finally] put into action to research a career move into something that is “creative” and “fun”. You know, something that was a part of me. So as I browsed through a popular business/start-up site at work, waiting on my clients’ emails, I landed on an article titled “the business of balloons”. Well, I took a class (just for fun) that was offered at this balloon wholesale/distribution company that I found in Google’s search engine. 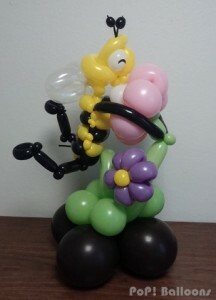 It was an awesome experience to know how a balloon rocking chair sculpture was built or the layering of a spiral arch. It was a field that become “love at first flight” and I diligently practiced, sometimes sleepless nights, obsessed with improving on my décor one design at a time. 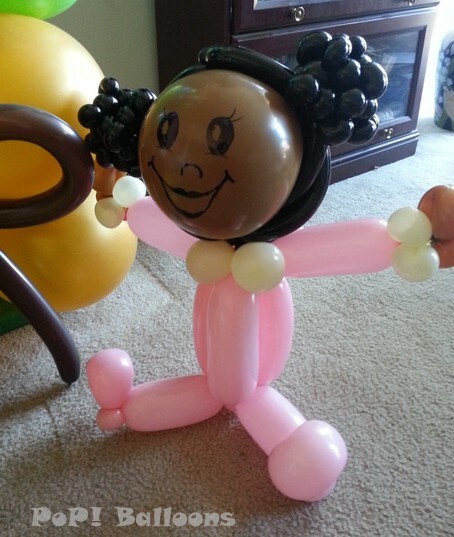 With balloons, you can make almost EVERYTHING. From twisted characters to large life-like sculptures. A cluster of helium balloons formed into a cloud or a massive balloon bouquet made of different sizes, shapes, and foils. But…the most joy comes from the amount of smiles and amazing expressions I receive from all people of different ages, cultural background, income, race, religion, or gender. Anger turns to happiness, frowns flipped upside down, and [a child’s] anxiety is calmed.